With the release of the March 2016 prospective plantings report the USDA weighed in on what we saw as one of the top questions for 2016: How many acres of corn and soybeans will U.S. producers plant in 2016? Their answer: 93.6 million acres of corn, 82.2 million acres of soybeans, and 49.6 million acres of wheat. These estimates were substantially different than those expected by the grain markets and left many people scratching their heads as to why there would be such a large shift toward corn acres. The estimate of corn plantings is very large. Compared to 2015, this results in an additional 5.6 million acres of corn plantings, or a 6% increase. At a trend line yield of 168 bu/acre, the increased corn acres would add another 941 million bushels to an already well supplied market. It should be noted that even if all these acres are planted, a proportion of them will not be harvested meaning the total potential impact to ending stocks is slightly less. Still, the magnitude of the estimated corn plantings imply a very large corn supply. If realized, corn plantings would only fall behind only those seen in 2013 and 2012 in the modern era, years when commodity prices were much higher and the market was sending clear signals to plant additional corn acres. For instance, in 2012 and 2013 our estimates of the net crop insurance guarantees at 80% coverage for a high production farms in the corn belt showed an $87 and $65 per acre advantage to corn over soybeans respectively. This year the advantage was $9 per acre for soybeans. Since the end of February, price movements have done little to change that assessment. The budgets didn’t seem to indicate that this many acres would shift to corn, at least in the Corn Belt. The relatively poor economics of wheat production clearly factored in the USDA estimates as they estimated a pretty substantial decline in spring wheat plantings. This reduction frees up crop land for other crops, and based on the USDA survey, it appears that many producers intend to push those toward corn. The question that remains is why did corn dominate soybeans in the thinking of the survey respondents, when budgets do not look as favorably upon the advantage of corn? The first factor to examine is where USDA forecasts large increases in corn acres. 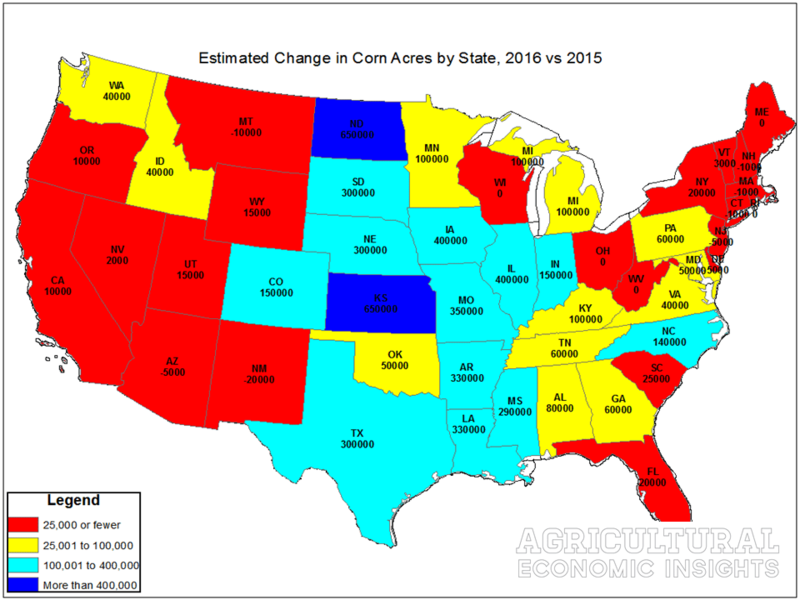 Figure 1 shows the estimated change in corn acres across the U.S. from 2015 to 2016. You can see that much of the increase is concentrated throughout the central plains. Kansas and North Dakota were both forecast to have the largest increases, adding 650,000 acres apiece, or 23% of the total increased acres in the U.S. In fact, the central plains states of with KS, NE, SD, ND, TX, and OK accounted for 40% of the increased corn acres. Corn Belt states also contributed significantly to the increased acres, with Illinois and Iowa expected to add 400,000 acres each, or 14% of the total increase. Figure 1. Estimated Change in Corn Acres, 2016 compared to 2015. Estimated March 31, 2016. Data Source: USDA NASS. 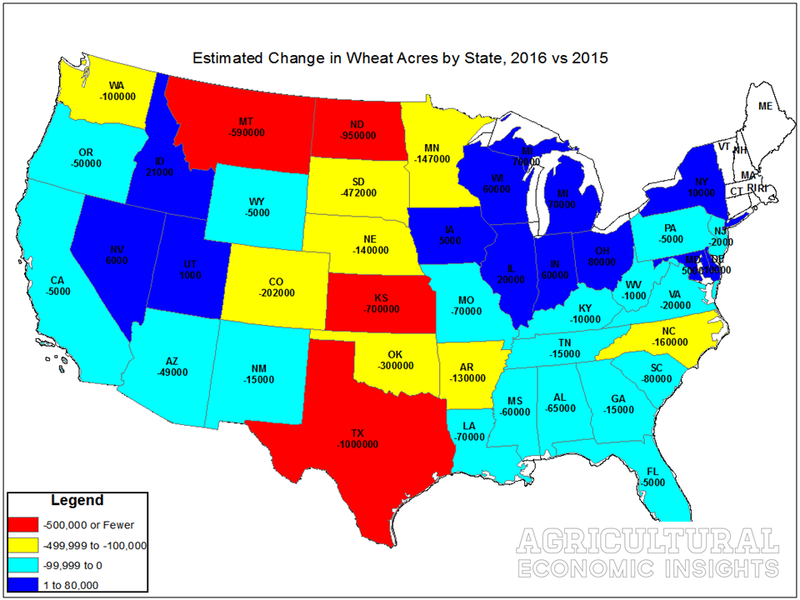 In the Plains States the increased corn acres appear to have come from substantial reductions in wheat plantings. For instance, ND farmers alone are expected to reduce wheat plantings by 950,000 acres from 2015. In Kansas, the story is similar with a reduction in wheat plantings of 700,000 acres. You can see a map of the wheat changes here. Compared to 2015, only 3 states were expected to increase soybean plantings by more than 100,000 acres, MO (950,000 acre increase), IL (200,000 acre increase), and ND (150,000 acre increase) (figure 2). The large increase in MO is presumably due the tremendous number of acres lost to prevented plantings in 2015. On the other hand, decreases in soybean plantings of 100,000 acres or more were forecast for 10 states, MS, LA, MN, KY, AR, IA, SD, NC, OH, TN. Figure 2. 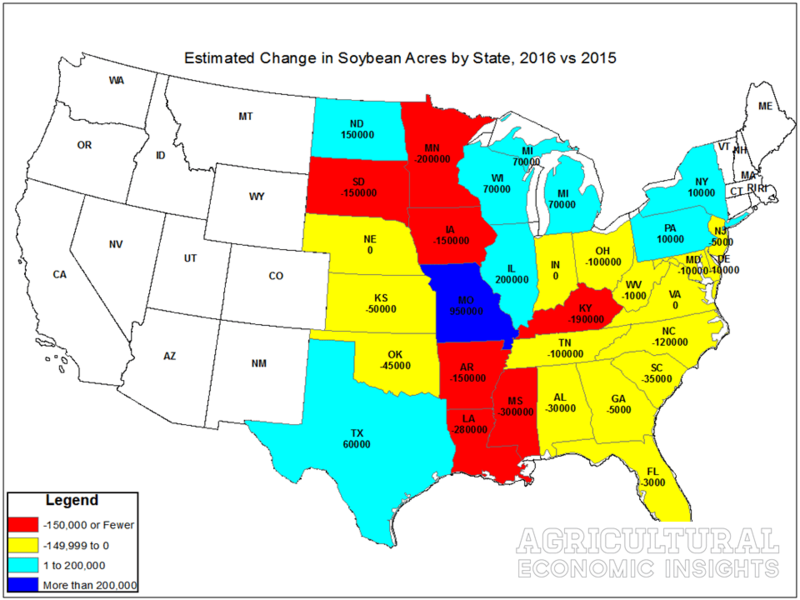 Estimated Change in Soybean Acres, 2016 compared to 2015. Estimated March 31, 2016. Data Source: USDA NASS. So it appears that many of the acreage shifts came at the expense of wheat, and to some extent milo, which was also forecast to see a reduction of 1.2 million acres. However, it still begs the question of why one would expect a large increase in corn acres with soybeans holding flat? The relative prices of soybeans versus corn did not indicate a large shift to corn acres (Figure 3). Based on the crop insurance price guarantees, which average prices for harvest delivery contracts during the month of February, the soybean to corn price ratio stood at 2.29. This is a level that did not appear overly favorable to corn production versus soybean production. Figure 3. 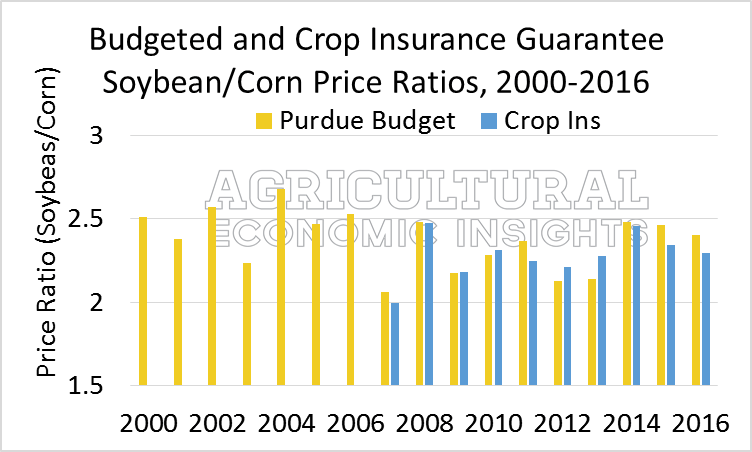 Soybean to Corn Price Ratio, Based on Purdue Budgets and Crop Insurance Guarantee. “… it is important to point out that this ratio is by no means a perfect indicator of gains/losses in corn and soybean acres. For instance in 2002 and 2005 the ratio was 2.57 and 2.46 and corn acres increased while soybean acres decreased. While we didn’t analyze the relative yields in that post, this would be a great time to look at that issue. To do this, we calculated the county level average corn and soybean yields from 2000-2015. Next, we calculated the ratio of corn to soybean yields in each county. The ratio provides a measure of how well corn performs relative to soybeans in these counties. The higher the ratio, the more attractive corn would be at a given price relationship. In other words, in areas where corn yields are high relative to soybean yields, one would expect that corn would be preferred until the soybean to corn price ratio gets really high. Following this line of thinking, one might expect that areas that are forecast to increase corn plantings this year would tend to have high corn to soybean yield ratios. Across the counties reporting corn and soybean yields, the mean corn/soybean yield ratio was 3.45. Figure 4. Ratio of Corn Yields to Soybean Yields, 2000-2015, U.S. Counties. Data Source: USDA NASS. 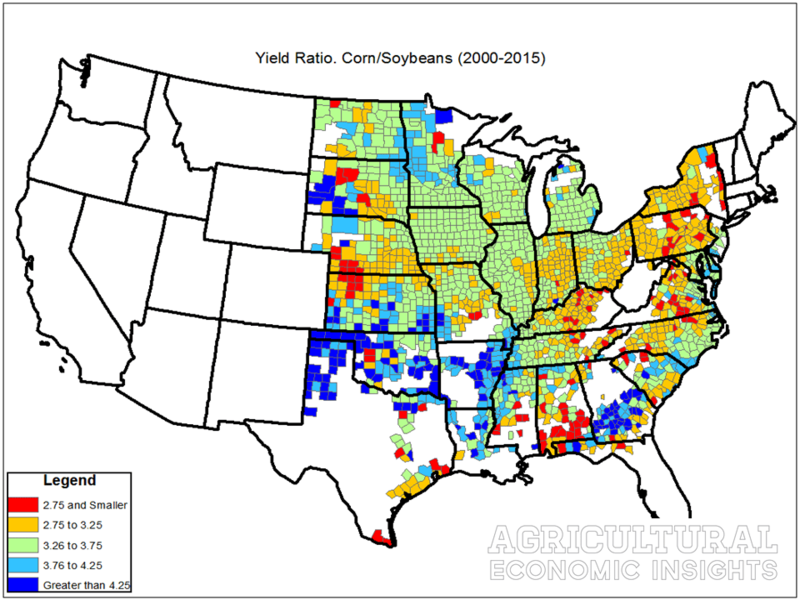 One can see from the map that the relative yields of corn and soybeans can be quite variable across the country. For instance, in states like Indiana and Ohio, lower corn to soybean yield ratios (yellow) are much more common than in states like Iowa (green), Minnesota (green and light blue), North Dakota (green and light blue), and some areas of Kansas (green and blues). This means that other things equal, corn would, overall, be more attractive states like Iowa, Minnesota, North Dakota, and Kansas than in the Eastern Corn Belt (Indiana and Ohio). This result helps to explain why farmers in the Northern Plains appear ready to expand corn acres while soybean acres basically hold their own. Similarly, it explains why Iowa is ready to expand corn acres (figure 1) while contracting soybean acres (figure 2). It should be noted the data used in figure 4 has an important caveat. The low ratio in Northwest Kansas and Southern NE are because irrigated and non-irrigated corn yields are reported together. At the same time, non-irrigated soybeans are fairly uncommon, so the ratio is comparing co-mingled irrigated and dryland corn yields against (more than likely) irrigated soybean yields. Thus, the ratio looks smaller than it might if irrigated corn were compared to irrigated soybeans. One should consider this before digging into the county-level data in these regions. As we look at the numbers, we are still a bit surprised by the large increase in corn acres relative to 2015. The profitability of corn production is not great, and given the current price relationships, it seems somewhat difficult to justify such a large shift toward corn on the basis of returns. There are many other factors that are likely in play as well. For instance, the decline in fertilizer prices probably made corn slightly more attractive than it would have been at higher fertilizer prices. Still, it is hard to believe that this was enough to shift acres this much. We have always (heavily) discounted the saying that “farmers love to plant corn” but …. Based on prices as of April 1, the soybean to corn price ratio stands at 2.52. At this value, soybeans should be attractive for producers in large regions of the U.S. As Dr. Bernanke pointed out, the simple act of forecasting a large shift to corn acres has pushed the price ratio toward making soybeans again more attractive. Perhaps, it will induce a slight shift back toward soybeans. We will find out in relatively short order.